Chamomile oil is a fungicide. You can buy creams and lotions, cosmetics, and topical preparations that combine or incorporate chamomile into the preparation. 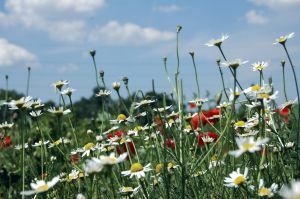 Chamomile herb is calming and soothing to the system as a tea, but you should be careful with its use if you have hayfever, because it's related to ragweed and just might cause an allergic reaction. Purchase a little chamomile oil, and use it as you would tea tree oil, or in combination with tea tree oil. Mixing the two should give you a very effective combination. Check your reaction to chamomile oil and if it seems to help, continue using it. If you find it aggravates your skin, or is more irritating and causes itching then by all means stop using it. When chamomile is used as a tea, it has been found to have anti-spasmodic properties, meaning that could relieve some muscle contractions, especially in the stomach and bowels. So you may find it helpful to help your body when there are complaints of gas or motion sickness, or in relieving colic in babies over two weeks old. It can also be very soothing to sensitive tissues in the mouth and nose and throat, and so it would be great as an additive to any inhaled steam bath for your nasal tissues and sore throat during a cold, of course you could get some of the same effect by just drinking a nice steaming hot cup of chamomile tea, we like ours sweetened with honey. As a topical agent, it's been used as a skin wash for minor skin irritations, and as a poultice for hemorrhoids. To use it as a poultice, make the tea with chamomile flowers, and soak a soft cloth in the very warm tea and then apply it to the injured area or hemorrhoids. It's thought that some of its action can be attributed to its ability to block histamine my body cells that is released during an allergic response. By blocking the histamines, chamomile may help your body get relief from the inflammation, itching, and muscle spasms.